Editor’s note: Kerstin Beise, a German physiotherapist, who also has an academic background in Indonesian history, is the founder of AccessibleIndonesia. She visited Indonesia for the first time with her father at the age of 14 and fell in love. She has now been living there for nearly two decades. Her aim with AccessibleIndonesia is to offer accessible-friendly tours and further develop accessible travel and tourism in the country. I was working as a physiotherapist in Germany, when I received a scholarship to come to Indonesia. For many years here, I worked with a Dutch NGO focusing on helping people with disabilities resulting from leprosy. When my job with the NGO came to an end, I was ready to start something new. Since I’ve been living in Indonesia for many years, I have developed a broad network here. I know the country, I know about traveling here, and I know many people with disabilities. I came up with the idea for AccessibleIndonesia, because I had a desire to help people with disabilities in a more creative way. A couple of years ago, I started talking to friends about the idea of launching an accessible tourism company, and everyone agreed that the concept was quite niche, since nothing like it existed at the time. However, Indonesia is not a very accessible country in general, so I knew there would be a lot of obstacles to overcome. I went to the International Conference of Accessible Tourism (ICAT) in December of 2014 in order to meet people from other countries who were are already experienced in accessible tourism, most of them having disabilities themselves. There were very few travel agencies present because unfortunately, there aren’t many that focus on accessible tourism. However, I got to speak with so many different organizations from all over the world, and we continue to collaborate and work together. This really motivated me to start AccessibleIndonesia. 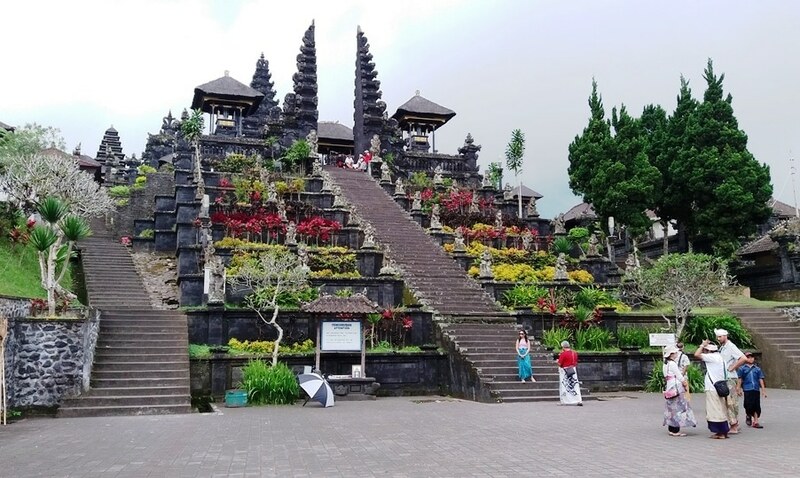 My first steps consisted of visiting the main tourist destinations in Indonesia to get an idea of how accessible they were. I spent a lot of time talking to local people with disabilities and asked them to share their travel experiences within the country in order to get a feel for what kind of obstacles they typically run into. This helped me to better understand the various challenges I would face while organizing tours. After gathering initial information, I decided to focus on three destinations: Bali, Yogyakarta, and where I live, Sulawesi. 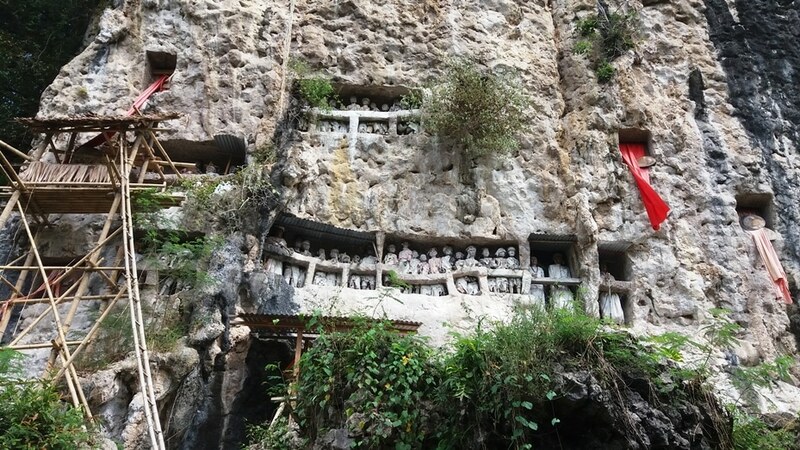 Indonesia is so big, and there are so many places to see, but people from abroad who come for the first time typically don’t want to see everything, they just want to see the famous spots! Once I selected the destinations, I started surveying friends who are wheelchair users and also those with other disabilities, such as visual impairment, to gather more data. I also spent a lot of time contacting and visiting hotels and tourist attractions. Indonesia signed and ratified the Convention for Rights of People with Disabilities (CRPD) very early (2007 and 2011, respectively), but implementation is slow. Just because the law is there, that doesn’t mean that all public places are accessible. It’s very far from that. Even for people without disabilities, it’s sometimes difficult to walk through a city, because there are big holes in the sidewalks or no sidewalks at all. Though Indonesia claims it is no longer a developing country, in that sense, it certainly is. People who come to visit cannot expect to find the same facilities or services as in the United States or Europe. It is good, however, that they ratified the CRPD, because now organizations here can use that as leverage to advocate for change. 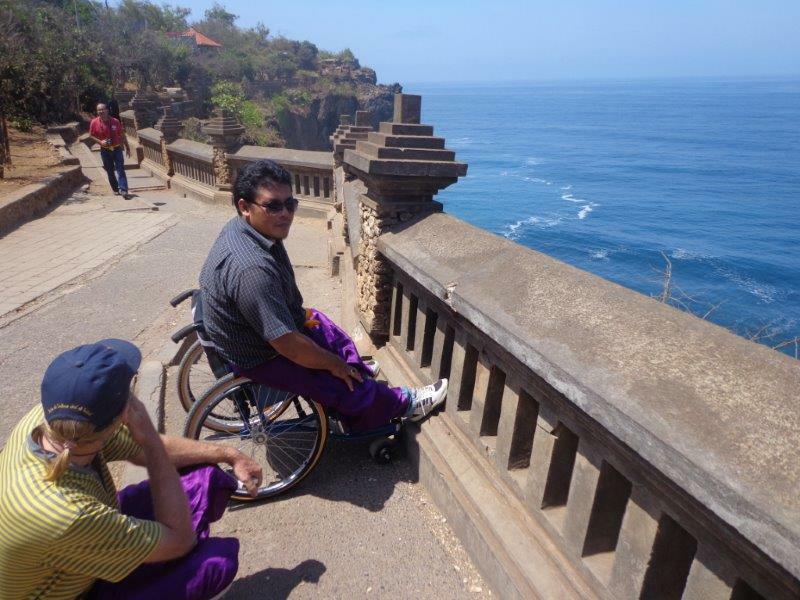 Since the country is not yet up to CRPD standards, AccessibleIndonesia provides a way for wheelchair users to visit nice places. People do need to know before coming that it’s not as easy as in other countries. In many situations, they may not be able to wheel themselves up to the spot, because it’s just not feasible, so we bring portable ramps, or drive up with a car as close as possible, or use other tricks we’ve come up with. In the main tourist areas of Bali, there are many hotels with accessible rooms. 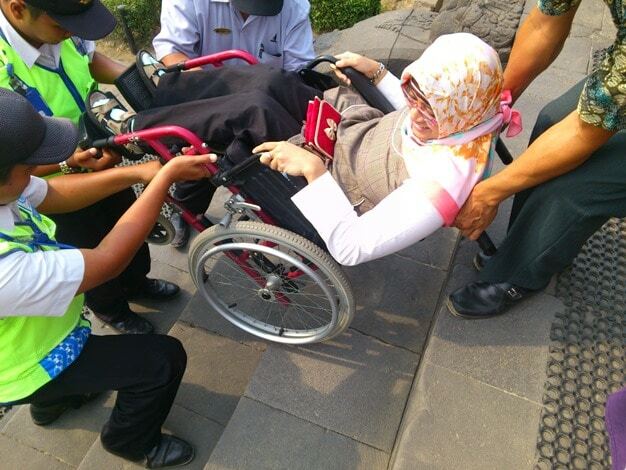 However, outside of Bali, there are virtually no accessible hotels. 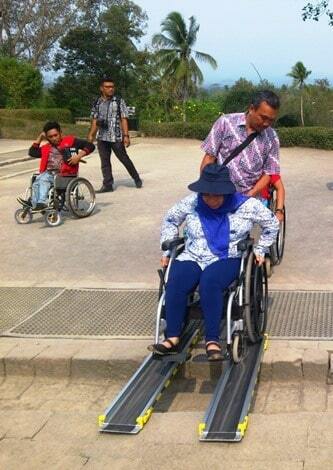 At AccessibleIndonesia, we often look for hotels that are accessible just by coincidence. They may have wide doors or no stairs, for example. We describe the potential advantages and disadvantages of the hotels to those interested in our tours so that they can choose if that destination will work for them. The Indonesian government is also keen on improving facilities for international tourists, and Indonesian people are very friendly and extremely helpful in general. If there are any problems or if someone needs assistance, they will certainly help. It’s a nice country to travel to for people with disabilities. 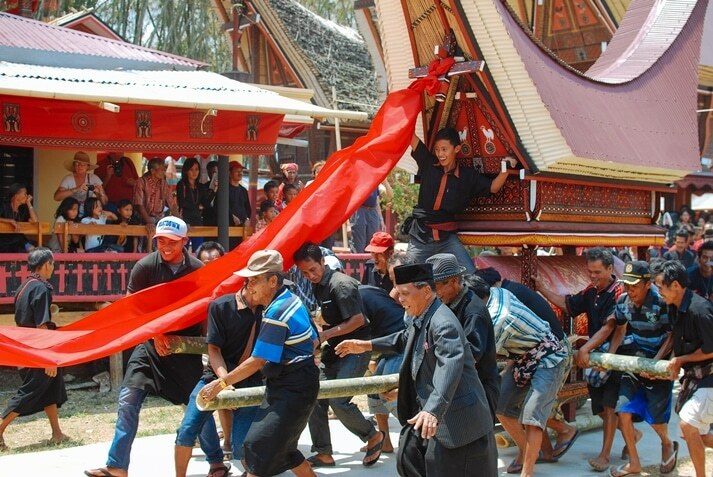 We offer accessible tours in three destinations- Bali, Yogyakarta, and Sulawesi. We do our best to make our tours barrier-free, by accompanying you on your tour to ensure a smooth travel experience. We will not pick only the easily accessible spots, but we will also go to the others. We want to show visitors all of the places that people with or without disabilities want to see- not only those that are easy, but really everywhere! However, there will be some exceptions. Some places are very difficult to get to, but most are possible with just a little bit of help, and that’s what we want to provide. We will do our best, we will test places out, and we will speak with visitors beforehand in order to understand what kind of needs and wishes they have. Our goal is to determine how we can best serve our tourists, giving them an exciting experience they’ll never forget. 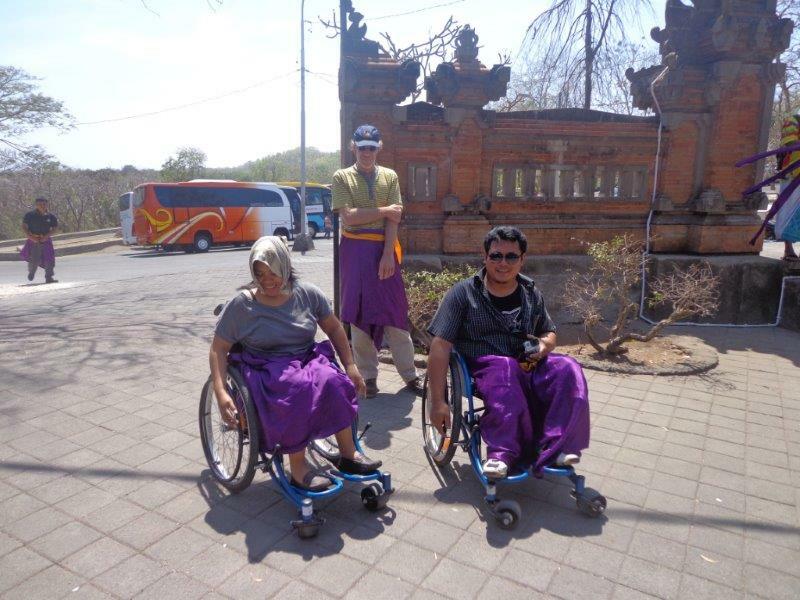 If you plan an accessible tour in Indonesia, we offer advice and support in direct communication with you. All booking procedures are handled by Vifa Holiday DMC Indonesia, while we remain your contact for the trip. We accompany tours ourselves to ensure smooth access as far as possible. We organize additional assistance and further equipment according to your requirements. We provide a range of appliances such as portable ramps, grab bars, and transfer devices. We meet you at the Indonesian airport and from then on, ensure that barriers are avoided, removed or overcome. We work with trained teams of assistants. Where needed, we arrange special permits to use alternative, more accessible entrances at touristic destinations. We help with procedures at the airport and in hotels. For more information on AccessibleIndonesia’s tour packages, and to learn more about everything they have to offer, visit them online at accessibleindonesia.org.